New Jersey Gov. Chris Christie says getting booed goes with the territory. 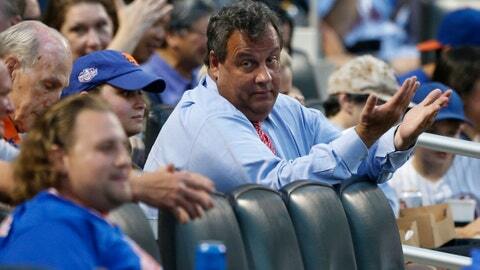 NORTH BRUNSWICK, N.J. — Days after catching boos after snagging a foul ball at a Mets game, New Jersey Gov. Chris Christie says he’s never seen a politician cheered at a sporting event except for President George W. Bush after 9/11. Christie said Thursday he knew he needed to give the ball he caught during Tuesday night’s game to a kid or he’d get even more criticism. The Republican says that booing comes with the job and noted that TV cameras didn’t capture the 10 to 12 people taking pictures with him between innings. Christie was sitting in the third row, near the New York dugout. In the third inning, St. Louis infielder Paul DeJong lifted a high foul that bounced in the stands. Christie reached out with his left hand and snagged it.